A straw bale home comes closer to NetZero building design than any of our options. Straw is a readily available renewable resource that regenerates annually, and can be sourced locally. This home holds heat and cool, but “breathes.” Air moves through it, while the straw retains it. Like a deer is able to stay warm all year, a straw bale home holds heat. The hair of a deer’s coat is hollow, and holds air, like the individual shafts of straw. Living in one of these homes is an unparalleled experience, some would say a spiritually aligned way to live in harmony with Nature. The quality of insulation in a straw bale home is very effective, keeping energy costs down. Due to the natural elements used in the building process, straw bale homes are considered one of the healthiest home options we have come across. The walls are coated with earthen plaster, creating an environment to live in that feels and smells wonderful. There is no off-gassing of volatile-organic-compounds, common to newly built homes. One way we can help you cut costs for this home type is in the labor. Ask us about hosting a straw bale workshop for your project. Learn more about EarthCraft’s straw bale homes in the Boise valley. Many of the design/build homes EarthCraft has created can be re-imagined and built with straw bale. You can trust that the necessary adjustments will be made architecturally, providing you the look and feel of any of these styles. With the added benefit of the natural living environment day in and day out. The Simonton House in Purdham, Nebraska. Built in 1908, the house remains standing today. 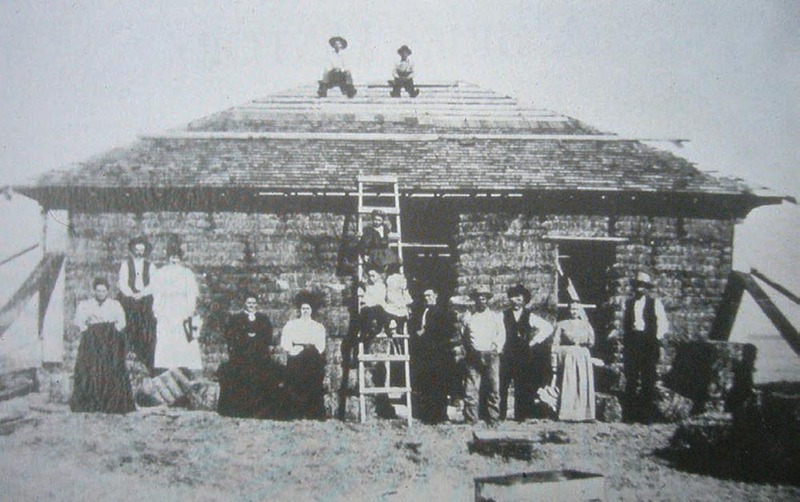 Straw bale homes date back to early settlement efforts in the Nebraska Sandhills where there was little wood to build with, or sod to create homes with. With the advent of the hay-baler people stacked straw bales for walls, placed a roof on top and learned how comfortable and effective this simple building method could be. Popular among musicians and those requiring quiet in the home, due to the thickness of the walls. Also ideal for creating a holistic healing environment or yoga studio. Bales of straw are compacted so tightly that once encased as walls and covered with earthen plaster the density makes them significantly more resistant to catching fire than conventional homes. Sharing know-how, success stories and cultivating community engagement opportunities around straw bale homes. Be part of the conversation on Boise Straw Bale!